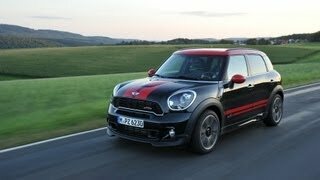 Just a couple of days back MINI unveiled its 2013 John Cooper Countryman Works (JCW) at the ongoing Geneva Motor Show. Reaction to this new version of MINI has been rather mixed. Many liked the idea of a raised seating height and increased passenger capacity, but many others were put-off by the new face and changed proportion of their favorite MINI Cooper. The ones who didn’t like the idea of the 2013 JCW are basically traditional and conservative MINI fans who like their MINI the way they saw it the first time. But as we all know that everything move with the ever changing times and so one cannot expect MINI to sit idle in this fiercely competitive market where consumers are looking for new things with every changing season. But whether or not the changes made in the new MINI JCW are actually worthwhile can definitely be questioned. As far as we at Dieselstation are concerned, we believe that MINI has definitely served quite a delicious affair with the 2013 JCW. 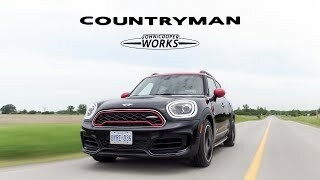 This vehicle builds on the highly appreciated and successful Countryman S and offers a more powerful engine, sporty style and better tuned suspension. The engine displacement in the 2013 JCW is same the same as the previous models, which is the 1.6 liter four-cylinder inline. But the engine boasts of an extra 30 HP with a peak output of 211 HP and a maximum torque of 207 lb-ft (221 with overboost). Even after this power gain, the company claims that the 2013 JCW will be much more fuel efficient compared to previous MINIs. Although the EPA numbers are not available yet, we believe it will be around 39mpg or could even better it. The 2013 JCW will be the first JCW model that will come with MINI’s ALL4 all-wheel drive system and it will also be the first to offer a six-speed automatic transmission compared to the six-speed manual one that has been the norm so far. The suspension in the 2013 JCW is definitely one of its big plus points. Thanks to stiffer springs and damper settings, much stronger anti-roll bars and a lower ride, the suspension in the new JCW works marvelously. As far as visual upgrades are concerned, the new JCW comes with a ‘chili’ red roof and mirror caps. But to check out whether the car lives up to all the promises it makes or not, you will have to wait till its official launch this fall. MINI’s exciting new model launch programme continues apace – literally – with the arrival of the MINI John Cooper Works Countryman. The performance-oriented flagship four-door Countryman is now the sixth member of the JCW family. But it’s the first to combine the brand’s motorsport pedigree with the critically acclaimed ALL4 all-wheel drive system. The debut of MINI’s six-speed automatic transmission as an optional extra is another unique feature on this car. The chassis has been developed on the back of MINI and JCW’s motorsport expertise. It includes a front axle with MacPherson struts, central-arm rear axle, electric power steering and a model-specific, high-performance braking system. John Cooper Works sports suspension is standard, with stiffened spring and damper settings, strengthened anti-roll bars and a 10-millimetre drop in ride height over the standard Countryman. DSC (Dynamic Stability Control) with DTC (Dynamic Traction Control) is also on every car. It means the Countryman provides outstanding agility and driving fun on any terrain. MINIMALISM technology – including Brake Energy Regeneration, Shift Point Display and Auto Start/Stop for models with a manual gearbox – means maximum efficiency. The result is fuel economy and CO2 emissions figures of 39.2mpg and 167g/km respectively (35.3mpg and 187g/km on the auto). To see the John Cooper Works Countryman in the metal, visit MINI’s stand at March’s Geneva Motor Show. The MINI press conference will take place on the MINI stand at 14:00 on 6th March. The BMW Group is one of the most successful manufacturers of automobiles and motorcycles in the world with its BMW, MINI, Husqvarna Motorcycles and Rolls-Royce brands. As a global company, the BMW Group operates 25 production and assembly facilities in 14 countries and has a global sales network in more than 140 countries. The success of the BMW Group has always been built on long-term thinking and responsible action. The company has therefore established ecological and social sustainability throughout the value chain, comprehensive product responsibility and a clear commitment to conserving resources as an integral part of its strategy. As a result of its efforts, the BMW Group has been ranked industry leader in the Dow Jones Sustainability Indexes for the last seven years.